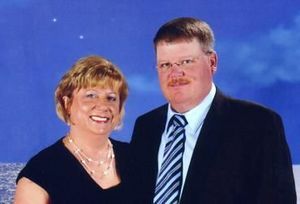 In the early hours of 4 Feb 2012, Troy and LaDonna French were gunned down in their home in Reidsville, NC. The couple awoke to screams from their 19-year old daughter, Whitley, who had detected the presence of a male intruder in her second floor room. As they rushed from their downstairs bedroom to aid their daughter, the intruder attempted to quiet the girl with threats at knifepoint. Failing this, he released Whitley and raced down the stairs. After swapping his knife for the handgun in his pocket, he opened fire on the couple as they approached the stairwell. During his escape, the perpetrator left a few drops of his blood on the handrail, apparently the result of mishandling his knife. DNA from this bloodstain would later prove crucial in enabling the Rockingham County Sheriff's Office (RCSO) to solve the case. With blood from the stairs, the North Carolina State Crime Laboratory produced a full DNA profile, presumably of the perpetrator, as it matched none of the friends or family who frequented the home, including Whitley, her brother, and her boyfriend at the time, John Alvarez. The DNA also did not match a profile in any DNA database, including CODIS. Without a database or suspect match, traditional forensic DNA analysis could only tell investigators that the perpetrator was male. Running short of leads, investigators began collecting DNA samples from anyone thought to have been in or around the French home. "We swabbed a lot of people," says Captain Tammi Howell of the RCSO. "Early on, if there was a remote chance someone could have been connected to the crime, we asked for a swab." In the first 12 months following the crime, over 50 subjects consented to provide a DNA sample. None of the samples matched the perpetrator. After a year of investigation, Rockingham County Sheriff, Sam Page, fearful the case was going cold, employed funds from the U.S. Department of Justice (DOJ) Asset Forfeiture Program to pursue alternative forms of DNA testing. The first break in the case came when familial DNA testing, performed at the University of North Texas, revealed the possibility that the perpetrator might be related to John Alvarez, Whitley's boyfriend. Because traditional DNA testing is limited in its ability to detect all but the closest relationships (e.g., parent-child), this report alone did not provide actionable information. Subsequently, scientists at the University of North Texas performed Y-chromosome STR analysis, which tests whether two male DNA samples share a common paternal lineage. This analysis, however, showed that the perpetrator did not share a Y-STR lineage with John Alvarez, seemingly eliminating John's father and brother as possible suspects. In Feb 2015, after reading about the recent debut of the Parabon Snapshot® DNA Phenotyping Service, Captain Howell contacted Parabon to explore the possibility of obtaining phenotyping analysis of the perpetrator's DNA. By April, samples were delivered to AKESOgen, one of the genotyping labs that supports Parabon's unique brand of DNA analysis. Unlike traditional DNA crime labs, AKESOgen performs genotyping of single-nucleotide polymorphisms (SNPs, pronounced "snips"), the millions of markers on the genome that collectively encode the genetic information that accounts for much of the trait differences in people. Starting with 30 ng of DNA, AKESOgen used the Illumina CytoSNP-850K chip to genotype over 850,000 SNPs from the sample, with an overall call rate of 98.9%. With the resulting SNP genotype data, Parabon scientists used Snapshot to predict the perpetrator's likely appearance and ancestry. A comparison of the Snapshot Composite Profile and a photo of José Alvarez, Jr. taken at the time of his arrest. On 7 May 2015, Parabon briefed Captain Howell and Detective Marcus Marshall, lead investigator on the case, about the Snapshot results for their sample. The subject's DNA indicated he had fair or very fair skin, brown or hazel eyes, dark hair, and little evidence of freckling. Face morphology analysis suggested the subject had a wide facial structure and non-protruding nose and chin. Importantly, Snapshot analysis indicated the subject had admixed ancestry, a roughly 50-50 combination of European and Latino ancestry consistent with that observed in individuals with one European and one Latino parent. John Alvarez has such admixed ancestry, but DNA analysis had ruled him out as a suspect, and Y-STR analysis indicated the perpetrator did not share a paternal lineage with John. 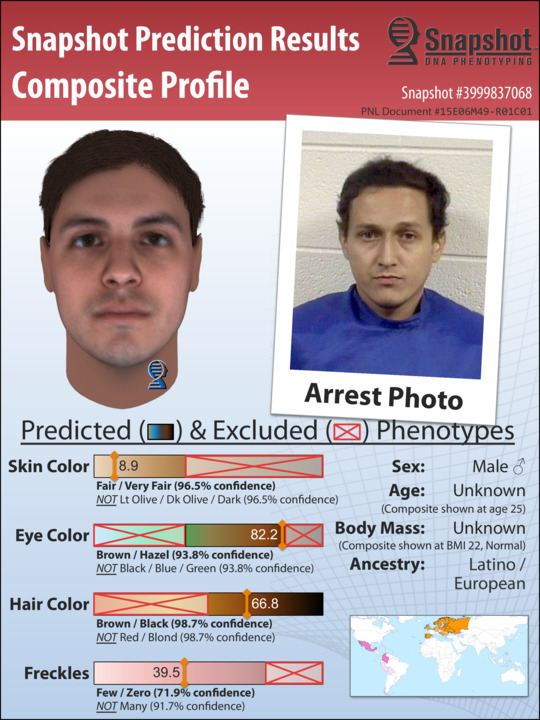 Nevertheless, the Snapshot predictions for the case were highly consistent with John's brother, José Alvarez Jr. "The Snapshot ancestry analysis and phenotype predictions suggested we should not eliminate José as a suspect, despite the Y-STR results," said Detective Marshall. "The likeness of the Snapshot composite with his driver's license photograph is quite striking." Within weeks of receiving the Snapshot report, Detective Marshall requested a DNA sample from José Alvarez Jr., and his father José Alvarez Sr. Both consented to be swabbed. Traditional DNA analysis proved beyond all doubt that the blood on the stairwell in the French home had come from José Alvarez Jr. It also showed, to everyone's surprise, that José Alvarez Sr. is not his biological father, which is why the Y-STRs did not match. José Alvarez Jr. was arrested on 25 Aug 2015 on two counts of capital murder. He later pled guilty to both murders and on 8 Jul 2016 was sentenced to two consecutive life sentences without the possibility of parole. This case highlights the limitations of traditional DNA analysis, as nearly all of the information needed to solve the case was present in the blood sample left at the scene, but without the RCSO's willingness to try new forensic DNA analyses like familial comparison, Y-STR analysis, and DNA phenotyping, the perpetrator might never have been brought to justice. After the investigation, Captain Howell admitted she had been skeptical about DNA phenotyping at first. Nevertheless, with a case about to go cold and only DNA to go on, she and the department had decided it was worth a shot. "Now that I have seen Snapshot in action," says Howell, "I am a believer."